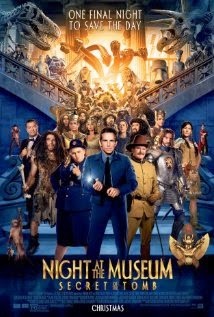 This weekend the Kingman Historic Theatre will be showing Night at the Museum Secret of the Tomb at 7:30 P.M Fri(Dec 26) 7:30 P.M. Sat (Dec 27) and 5:00 P.M. Sun(Dec 28). This movie is rated PG and stars Ben Stiller,Robin Williams and Owen Wilson!